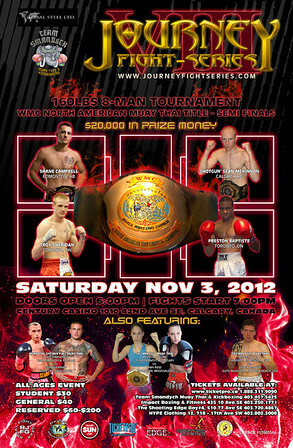 In addition to the main card the Journey Fight Series 8 event has been updated with matches from the amateur under card. I have always been personally impressed with how well developed amateur fighters in Canada have been. The maturity in their style and tactical smarts betrays a deeper fight record than what may first be apparent. For the professional fighters, I have a more thorough breakdown of the participants here. Adding to what looks like will become an action packed full rules Muay Thai tournament, Trevor Smandych may well have on his card the future of Canadian Muay Thai. I said the same thing ages ago to a friend when I watched Preston, Shane and the rest of the professional fighters coming up as young amateur fighters. I think I’m right here too. Ticket information is available on the official Journey Fight web site. Also be sure to checkout Journey Fight’s youtube channel full of fight clips from their past events. There are some pretty entertaining scraps on there that left me entertained for a long time.